When I told people I made banana muffins this weekend, their first response was “how much did the bananas cost you?? !” Since the floods in Queensland, I haven’t bought a banana. No, the bananas I used in this recipe were from my freezer. Is it ok to use frozen bananas that have been tucked away for over 6 months? I hope so. As I write up this post I’m munching away on one, and old bananas or not, they are pretty darn tasty. I always freeze bananas because I never get around to eating the whole bunch when I buy them. Baking with frozen bananas is so ideal that it’s a blessing in disguise. I’ve written bananas too many times. I was watching TV not long ago when Donna Hay make these really quick blueberry muffins on her new series, Fast, Fresh, Simple. I clearly remember her saying that the base recipe of the muffins could be adapted to any other flavour. So I jumped on the internet, found her recipe (you can find the book here), and yep, it really is a great base recipe. I didn’t change anything besides omitting the blueberries and adding banana. Oh, and I adding some crushed up white chocolate bits on top because I had some left over from my last lot of muffins. 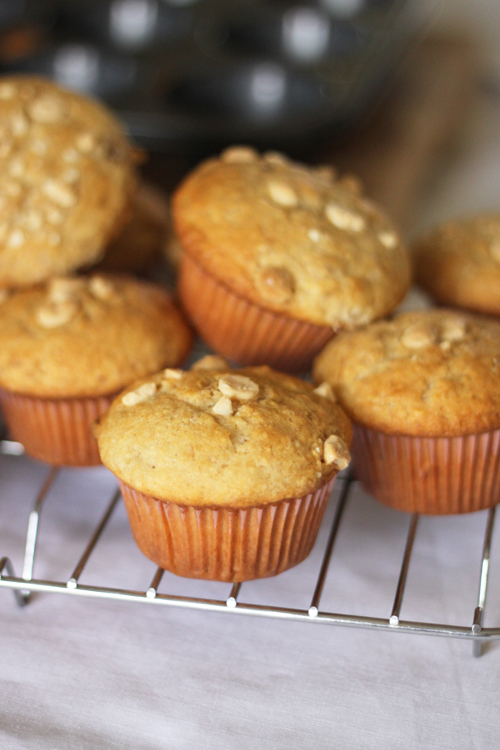 You could also add crushed up nuts, like almonds or walnuts, on top of the muffins. In a large bowl, add the flour, baking powder, sugar, oil, egg, milk and vanilla. Mix well with a spoon. Add the banana and continue to mix. Fill the paper cases with the mixture, and sprinkle a little of the granulated sugar on top. Bake for 30 minutes, or until a skewer comes out clean when tested. Cool on a wire rack. haha don't worry I did exactly the same recently and pulled all these old frozen bananas out and used them in muffins. Worked perfectly! Yum I miss bananas!!! Am preparing to come back to Australia for a couple of weeks from London. Am thinking I'm going to need a special line item in my budget for bananas. Nb, just discovered your blog and am kicking myself for taking so long. Your photos are exquisite. I just stumbled upon your blog and I absolutely love it! I can't wait to try out your recipes, especially these muffins. Thanks! Haha, Tori, when I'm shopping for fruit I walk straight pass them, they are so expensive! these look fantastic! 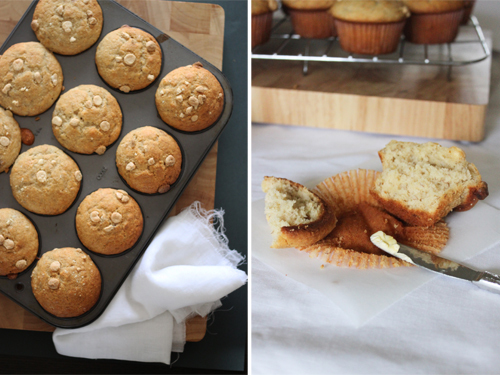 love banana muffins! Great recipe, I'm looking for more to try now!